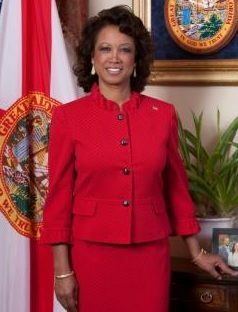 TALLAHASSE, Florida -- Florida Florida Lieutenant Governor Jennifer Carroll resigned yesterday following a crackdown on internet cafes in Florida by the U.S. Secret Service, FBI, IRS and various state and local law enforcement agencies. The internet cafes, operated by Allied Veterans of the World, are accused of several illegal activities including gambling and money laundering. Carroll has had business ties with the organization which include representation of the purported non-profit by Carroll's public relations firm. Carroll's said in her resignation, "Effective immediately, I hereby resign the Office of Lieutenant Governor of the State of Florida. It has been an honor to have served the State of Florida in this capacity"
Carroll oversaw the Florida Department of Military Affairs, Florida Department of Veterans Affairs, and was Chairperson of Space Florida. Florida Attorney General Pam Bondi, FDLE Commisisoner Gerald Bradley, U.S. Attorney Bobby O'Neil, along with representatives the IRS, U.S. Secret Service, and Central Florida Sheriff's Departments will hold a press conference regarding the investigation at 2:30 p.m. today. Report: Florida Most Corrupt State In U.S.